MuscleTech Platinum 100% Iso Whey - 3.34 Lbs. (Gourmet Milk Chocolate) for $27.96 at A1 Supplements! 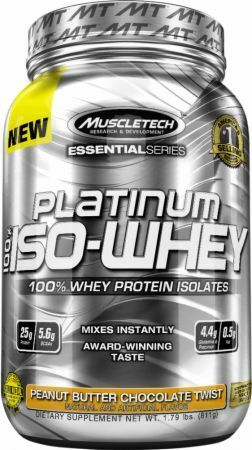 MuscleTech Platinum 100% Iso Whey - 3.34 Lbs. (Gourmet Milk Chocolate) for $26.21 at A1 Supplements! Pure isolate under $9/lb? YES. But when you can get the unbelievable Peanut Butter Chocolate Twist flavor for that cheap?! YES!! Lactose intolerant users who are looking for a new protein, this is the deal! Price Per Unit to get on Deals Page: $9.00 per Lb. Price Per Unit to generate email blast: $8.00 per Lb.